Founder Director of Sounds Baroque. Guildhall School of Music & Drama. Royal Opera House (Covent Garden). Forget, for a moment, modern life. Switch off the lights, light some candles and ignite the laser light which will perform your music... Choose your most comfortable and favourite sofa, help yourself to some true 18th century punch (each house had its own recipe for their guests at their music soirées) and enjoy your perfect 18th century soirée... with the music by Mozart, his friend and mentor J.C. Bach, his beloved rival M. Clementi and two highly skilled and sensitive performers leading us through this charming journey on very beautiful historical instruments: Julian Perkins and Emma Abbate. 3. Mozart: Piano Duets Vol. 1. 4. Mozart: Piano Duets Vol. 2. As you can see from the special story behind these works for piano 4-hands (and especially those by Mozart), all the pieces (apart from K19d and, in part, K381) can be considered, in general, difficult or rather demanding pieces, even though at different levels, with K381 (for Mozart) probably an easier work and K521 and K497 the most difficult ones, also in consideration of the very careful interpretation needed here. The first impression you'll have by listening to this marvellous series of CD Albums by Julian Perkins and Emma Abbate is the absolute charming beauty of their cantabiles and the authentic brilliant and lively Mozartian verve and spirit which breathes from every note. Their singing and almost operatic style of playing these works 4-hands is finely endowed with a joyous sprezzatura, which this kind of music always always requires, to be correctly performed. Moreover you will really enjoy the fine and delicious variations created by the two pianists at any ritornello. An art this even more appreciated, since, even though the two performers correctly never go too far, it gives a fine and vivid hint of what probably was the actual lively and a bit free performance practice, during the music gatherings of Mozart and his friends. The interpretation of these pieces reaches a splendid fusion of intents, which, thanks also to the accurate choice of proper historical instruments rich in a marvellously warm sound (especially those used for Mozart's piano duets), creates a much enjoyable 18th century atmosphere and is well co-ordinated between the two players. The accurate work in rendering a beautiful, brilliant and refined fraseggio makes a few tracks of these CDs particularly remarkable for their interpretation. You'll certainly enjoy, in particular, the sonatas K381, K521, J.C. Bach's and Clementi's Sonatas and the magnificent monumental K497, with its 1st movement cantabiles and dynamics, the delicious fraseggio of its 3rd movement and, above all, both the Adagio and the Andante rendered with such a magical timbre and a series of soft nuances of expression which well paints the subtle musical texture of this piece... and all this under the masterly hands of the duo Perkins-Abbate, a duo that demonstrates too well how the music by Mozart, Clementi and J.C. Bach must really sing. Julian Perkins and Emma Abbate perfectly master all the technical and mechanical characteristics of the historical pianos used for these recordings, so that they are capable of achiving those peculiar suggestive tones and that peculiar warmth and softness and delicacy of sound... id est all those interpretative subtleties which are especially demanded by the very nature of the pieces themselves, and, in particular, those Mozart's passages in K497 piano and pianissimo will resound in all their fascinating velvety beauty. The Mozartian interpretation given by the duo Perkins-Abbate can well be seen within that glorious tradition of a few great Mozart interpreters such as Edwin Fischer and Alicia de Larrocha. This beautiful Series of CD Albums will make you appreciate, one more time, some beautiful masterpieces by Mozart, J.C. Bach and Clementi, from their very special convivial or Geselligkeit repertoire, and probably, thanks to the two brilliant interpreters and their fine choices... in the most authentic soirée atmosphere possible. The very interesting choice made by Julian Perkins and Emma Abbate offers the possibility of exploring a special repertoire for piano (and a particularly difficult one, since it was usually thought, in origin, for an elite category of extra-skilled interpreters) and to cast some light, through the music itself and Perkins-Abbate's interpretation, onto the tradition of social music gatherings in the 18th century and on the forms of musical practice and performance. Quartets, quintets, trios, duos, duets, etc. i.e. chamber music in general played an important role in the social habits of the 18th century society. Music soirées (either soirées organized at some very notable stylish salon or simple gatherings of friends for playing some music among dinners, good food, spicy drinks, some dancing, much talking, music listening and music playing: according to the Irish tenor Michael Kelly, one of the first performers of Le Nozze di Figaro in 1786, a good punch, at these soirées, was the favourite drink of Mozart himself: «He was remarkably fond of punch»; and from other accounts we know also that Mozart adored dancing) were a fundamental part of the social life in the second half of the 18th century and the public demand for new music (to be consumed at the soirées with one's friends, both amateur players and professional musicians doesn't matter) was really abundant and important. A few composers even managed to transform all this into a profitable business, like Kozeluch and his own publishing firm, the Musikalisches Magazin, founded in 1785. Also Mozart had his part, and a considerable one, in this peculiar context of social habits. Apart from his quartets, the piano sonatas, the violin and piano sonatas, etc. production, he and his sister, when travelling across Europe (literally as child prodigies of Nature), managed to make a particular form of work for keyboard rather popular: the pieces for keyboard 4-hands, an interesting form of performance, which could well highlight the incredible capabilities of the two performers. «The first instance of two persons performing on one instrument in this kingdom was exhibited in the year 1765 by little Mozart and his sister». After this first period of marvellous public performances by the Wunderkind himself, this kind of repertoire remained a sort of firm label for Mozart and his sister throughout the 1770s and those people who wanted to meet Mozart, his sister and his father personally, and privately, could reach the house of the Mozarts at Salzburg and have the possibility of listening to Mozart and his sister playing piano duets. When Mozart left Salzburg to reach Vienna, many things changed drastically in the life of Mozart. Nonetheless, as far as we know, the Viennese social gatherings gave the occasion to Wolfgang to approach the genre of the works for keyboard 4-hands (and that for 2 pianos) on a completely new basis: no more his sister at his side, but the composer, singer and pianist Marianne von Martinez and then Caroline Pichler and Franziska von Jacquin, the sister of his close friends, the von Jacquins, who usually organized Geselligkeit evenings (i.e. conviviality evenings) on Wednesday evenings are among the names we know associated to the piano 4-hands production and performance by Mozart. So these women, who, after 1781, usually played piano 4-hands works with Mozart in well known social contexts, were skilled performers belonging to notable families who regularly promoted music soirées in Vienna. As for other music genres cultivated by Mozart, the great master never thought to simplify his art, his music to meet the trivial necessities of common music amateur players (as other composers of his era did) and even when he writes music for the principianti his art remains sublime and untouched in its masterly construction. That's the reason, in any case, why Mozart's music was not a particular best seller in score in that period, being de facto too sophisticated or even difficult for the average amateur player of the music soirées... (see, just an example among others, the problems with his Dissonance Quartet) and why Kozeluch became richer than Mozart in this peculiar branch of music mass production of the 18th century. Nonetheless, as far as we know from various accounts on Mozart at the soirées (see Michael Kelly, Da Ponte, Caroline Pichler and others), when there was a soirée and Mozart was there with his friends, Mozart's music was often in the programme of the music soirée (written music or improvised one were both common) and often with highly distinguished listeners (i.e. the great Neapolitan composer Paisiello) and highly distinguished performers (i.e. Haydn, Maximilian Stadler, Dittersdorf, Vanhal and others). And we have also a curious anecdote on Mozart, playing piano duets during these conviviality evenings: at Caroline Pichler's own salon, the highly talented lady pianist Pichler was playing some music at piano and suddenly Mozart sat at her side and stopped her playing and then started improvising a piano duet together (it seems he was reworking some music from his Figaro) and when they completed their improvisational duet piano performance, Mozart «began leaping and somersaulting about the room while meowing like a cat». Was Mozart happy with Pichler's ability in improvisation 4-hands?... Being a piano duet improvisation a difficult art of its own not for the average common amateur music performer, such episode highlights the great talent of Caroline Pichler as pianist, that very Pichler who was considered «one of Vienna's foremost lady pianists with a masterly touch, strong in execution, and undaunted by the greatest difficulties». Those, who well know the complicated story behind most of Mozart's music fragments apparently left unfinished, will discover, in this anecdote, the great master's habit of jotting down some ideas derived from his own soirées musical improvisations of the kind described by Caroline Pichler. And therefore the famous fragments of Mozart's piano 4-hands works still surviving belong to this very peculiar category of compositions: works, in reality, fully performed as improvisation during some music gathering, then written down on some music paper by Mozart as a pro memoria of some good ideas and then left without completion, even for years: the Clarinet Concerto K622 is a great example of this way of working. 3. Mozart: Piano Duets Vol. 1. Dedicated to Nannerl and Franziska von Jacquin. 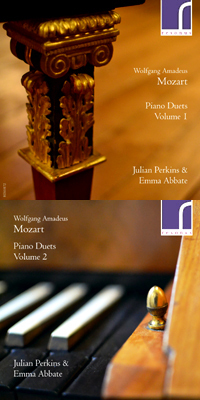 With their particular choice, Julian Perkins and Emma Abbate wanted to dedicate the first volume of the piano duets to two important figures in Mozart's life: his sister and companion of professional concerts tours Nannerl Mozart and to Franziska von Jacquin (or in Mozartianese own language Sigra. Dinimininimi), that talented pianist pupil of Mozart (and sister of one of his closest friends Gottfried von Jacquin, in Mozartianese language HinkitiHonky), who often became the official and/or unofficial dedicatee of various difficult piano masterpieces by Mozart during his stay in Vienna in the 1780s. ... and, under a certain point of view, the story of piano 4-hands music production is really also the story of a few of the most famous lady pianists in history, from Nannerl Mozart to Caroline Pichler. The two duet sonatas K381 and K358 were written in 1772 and in 1773/1774 respectively. They were intended to be performed with Nannerl at Salzburg during various occasions, and, in particular, when someone wanted to meet the Mozarts in person at their home. The manuscripts of the two works remained in possession of Nannerl after his brother's leaving for Vienna in 1781. However, Mozart kept copies of these works as a fundamental vademecum for his teaching activity and, when in Mannheim (1777-1778), he used these particular duets to be played only with the best students there. When in Vienna, Mozart managed to have these two pieces published by Artaria in 1783 among his first printed works and this is sufficient to understand the importance of such compositions for Mozart. Probably these works were among those performed 4-hands with Marianne von Martinez at her own very famous Viennese salon. «Give this sonata to your sister [i.e. Franziska] with my compliments and tell her to start working on it at once as it is rather difficult». However, the final published version appeared in 1788 as dedicated to another pupil of Mozart, Babette de Natorp, and to her sister Nanette. And again Mozart's choice makes us understand that Mozart saw this kind of difficult works for piano 4-hands as a sort of official recognition of the particular technical command of the piano technique attained by his pupils: is it a reminiscence of his own musical path as a Wunderkind? 4. Mozart: Piano Duets Vol. 2. A masterpiece, again Nannerl and possibly Pichler's (?) fragments with a World Premiere Recording. With their second volume of piano duets, Julian Perkins and Emma Abbate decided to shift their interest onto the masterpiece of this collection of piano works 4-hands (K497) and onto a very interesting series of fragments (K357 in a new modern completion in a world premiere recording) and onto a fundamental doubtful work (the K19d), the two latter ones both important compositions to comprehend the technique, method of work and the most intimate world of sounds of the great master. Both K521 and K497 belong to a professionally marvellous period for Mozart: that extremely prolific series of two years between Le Nozze di Figaro (1786) and Don Giovanni (1787). This K497 4-hands is universally recognized as one of the highest point of Mozart's art, along with the most famous series of his Haydn Quartets and has been always scholarly praised for his excellent musical texture by such scholars as Alfred Einstein and Donald Francis Tovey. What is demanding here is not only the musical piece itself, but its very interpretation and once more we realize how Mozart considered such works for piano 4-hands not a mere trivial occasion of playing music with his friends, but rather, and without any compromise, a sort of artistic summa of piano technique. And that's why, as Alfred Eistein pointed out, we find here the elements typical of Mozart's orchestral works and of piano concertos with even pre-Beethovenian nuances and atmospheres. The Sonata K19d belongs to the London period (1765) and probably it was the piece used by Nannerl and little Wolfgang during their astonishing series of concerts as natural music prodigies. This Sonata is at the very centre of a scholarly dispute, since its paternity is not certain (we are not sure that child prodigy Mozart wrote this work in 1760s) and hence it has been recently moved among the works of doubtful authenticity. Nonetheless this very Sonata must have had a great influence on Mozart, because a clear and distinct echo of its brilliant finale movement Rondeau: Allegretto can be heard in the finale of the Gran Partita K361 (1781) and both in the finale of the piano sonatas per principianti K545 and K547a (both 1788). The fact that Mozart re-worked the finale of K19d (a piece which belonged to his youth and to the London year 1765) for his famous piano sonata per principianti must be surely somehow meaningful. The two music fragments re-united and completed in the 19th century as K357 belong to that amazing huge corpus of music fragments and snippets left by Mozart. The art of completing such fragments left by Mozart unfinished (at least on paper, since probably he performed them in a full form during his concerts... or during the conviviality soirées, thanks to his incredible improvisational talent) has an old and long tradition which dates back to Mozart's friends such as Maximilian Stadler and Süssmayr and to his wife Constanze. The 19th century completion left by Andrè (1853) is characterized by a few philological problems. So, being Mozart's original fragments (which belong to two different periods, 1787 and 1791) sufficiently rather long, the modern accurate work carried on by Levin restores the fragments of Mozart in a new completed form, this time respectful of the original compass of Mozart-era pianos and of Mozart's own technique of composition. Perkins and Abbate present here the world premiere recording of this completion by Levin and we hope that this completion will find its way towards popularity among international pianists. 5. J.C. Bach - M. Clementi: A wise and correct habit. The inclusion of piano 4-hands works by J.C. Bach and by M. Clementi is a very wise choice by Julian Perkins and Emma Abbate. And it must be said that fortunately it is an increasingly wise and correct habit from the modern generation of 18th century music performers, i.e. to have, for example, Kraus's symphonies in the same CD Album with Haydn's symphonies etc. If in the era of Mozart there were many Kleinmeister of scarce quality, on the contrary, there were many great masters of that era, whose work for various and even bizarre reasons did not receive the right attention it deserved. Unfortunately what many people usually fail to correctly comprehend is that such composers like J.C. Bach, Vanhal, Dittersdorf, etc. developed their own personal Classical Era style already in the 1760s, when Mozart was only 5 years old and that child prodigy Mozart grew up studying and practicing in the style of these composers... even though the bad long habit of considering the music of the 18th century as a whole undifferentiated organism might lead to erroneously think the contrary! So, thanks to the duo Perkins-Abbate, the two works by J.C. Bach and M. Clementi will be a nice discovery in this set of CD Albums and a motive of true enjoyment, being their sonatas 4-hands really delightful! Even though written only in 1778 the Sonata in A major by J.C. Bach features many characteristics of his own style (in particular its Allegretto), that finely singing style that the young child prodigy Mozart, in 1765, had the possibility of studying with the composer in person in London and then, during the following years, through J.C. Bach's scores. After 1765, J.C. Bach and Mozart remained always on friendly terms and in 1770 Mozart even officially became the pupil of the same famous teacher as J.C. Bach, that Padre Martini of Bologna, Italy (an authentic father of many great music composers), whose golden rule in composition was that «the beauty in music reveals itself naturally as a natural expression of masterly constructed parts», as Jommelli, another famous pupil of Padre Martini, put it more or less. 6. Mozart & Clementi again... a curiosity from Spring 1786. The story of Mozart borrowing from Clementi's piano works to create his famous overture for The Magic Flute in 1791 is well known and it is also well known how, according to Clementi, all this originated from Mozart's reminiscences of their famous duel occurred ten years earlier in Vienna in 1781. Now this may seem pure impression and fortuitous coincidence but Clementi's Sonata Op. 14 No. 3 features in his Rondo: Allegro a well marked bar, which works as the conclusive seal of the whole piece and which curiously sounds like the extra-famous rhythmic motive of the Farfallone Amoroso from Le Nozze di Figaro. The similarity here must be purely coincidental... A direct influence here may be probably very difficult and, above all, should be strictly historically and properly documented, but since this Sonata 4-hands by Clementi was first published in March 1786 and Mozart's Figaro premiered in May 1786... well... what a striking coincidence! Moreover this work by Clementi (performed on an ancient original square piano by Clementi & Co. London) is certainly among his best and liveliest products ever and the Adagio and the Rondo: Allegro are really two magnificent and very enjoyable masterpieces in their own right!